ABBY™ Articulating Ankle/Foot Orthosis is a Multifunctional Ambulatory Articulated AFO for your patients in the earliest stages of rehabilitation. With a stable base of support, it replicates biomechanical effects of semi solid or PLS AFO. The ABBY™ Articulating Ankle/Foot Orthosis is a heat-molded foot orthosis that fits either left or right, and delivers adjustable dorsi and plantar flexion and adjustable inversion and eversion. Since 1990, Anatomical Concepts, Inc. has developed medical devices, custom-fit and custom-fabricated orthoses for both upper and lower extremities.. 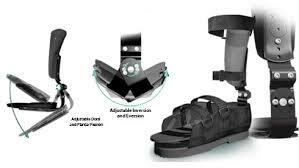 The company is the original concept developer of the PRAFO® Orthosis used in medical facilities internationally. All Anatomical Concepts' products are designed and manufactured with pride in the USA.